My town has a beautiful lake. It’s deep and cool water makes it popular with fishers and boaters, and swimmers who fill the small beach during the summer. Every year a few people disappear without a trace and are declared drowned. Fishers disappear from their boats, and swimmers dive in and never surface. I had a friend who would go swimming there with his family on weekends. Normally, they would wade knee-deep and sit on the beach, but last year he was feeling overheated and decided to cool down in the deeper part of the lake. He swam far out and treaded water until his hands and feet went numb from the cold. Just as he was getting ready to return to the beach, he felt something slimy slide against his foot. He ignored it, thinking it was a fish. He felt it again, but this time it wrapped around his calf, and started pulling him under the water. He started kicking, and was released. Frightened, he swam to the shore and crawled up onto the rocky beach. Blood streamed down his leg from hundreds of tiny needle-prick wounds along his calf. 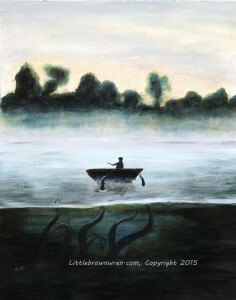 Another friend was out fishing one morning, casting out from her canoe to catch panfish. She felt something catch the hook and started to reel it in. The line went slack for a moment, just when her boat violently flipped over, dumping her into the dark water. She quickly surfaced, but could find no sign of her boat or any of her gear. Something terrible lives in the deep water. Don’t go in. This is an original story, based on my life-long fear of deep water. This sort of fear is called Bathophobia, meaning fear of the depths. I think that most people were afraid of deep water as children, and most can rationalize the fear away. What am I afraid of? I am afraid that something is there that I cannot see.